Natalie J. Sayer began studying and applying Lean before it was formally known as Lean. Over her 20-year career in the automotive industry in the United States and Mexico, Natalie honed her skills applying Lean and Organizational Development methods across functional areas of Fortune 130 companies. In 1996, Natalie was an instrumental team member in the Lean transformation of a GM facility in Matamoros, Mexico. The team was awarded the 1996 GM President’s Council Honors for the project. While working with General Motors, she had multiple opportunities to visit and learn from New United Motor Manufacturing, Inc. (NUMMI). Natalie has trained, coached, mentored, and rolled up her sleeves to implement Lean practices, whether working in a company or volunteering at a food bank. She received a Bachelor of Mechanical Engineering from the University of Dayton in 1988 and a Master of Manufacturing Systems Engineering from the University of Michigan in 1992. She is a graduate of Coach University and Corporate Coach University. Natalie is also a Six Sigma Black Belt and a Global Leadership Executive Coach. Bruce Williams strives for perfection and added value as a scientist, educator, consultant, and entrepreneur. Leveraging the Lean principle of standardized work, this is his third For Dummies book in three years, having previously coauthored the best-selling Six Sigma For Dummies in 2005 and the Six Sigma Workbook For Dummies in 2006. Undergraduate degrees in physics and astrophysics from the University of Colorado testify to his early pursuit of understanding the ultimate nature of root cause. Chapter 2: The Foundation and Language of Lean. Part II: Understanding Flow and the Value Stream. Chapter 3: Seeing Value through the Eyes of the Customer. Chapter 4: A Resource Runs through It: Value Stream Mapping. Chapter 5: Charting the Course: Using Value Stream Maps. Chapter 6: Flowing in the Right Direction: Lean Projects and Kaizen. Part III: The Lean Toolbox. Chapter 7: Customer and Value-Stream Tools. Chapter 8: Flow and Pull Tools. Part IV: The Lean Enterprise. Chapter 11: Lean in the Organization: Principles, Behaviors, and Change. Chapter 12: Power to the People. Chapter 13: Go Lean: Implementation Strategy, Startup, and Evolution. Chapter 14: Lean within the Enterprise. Chapter 15: Lean across Industry. 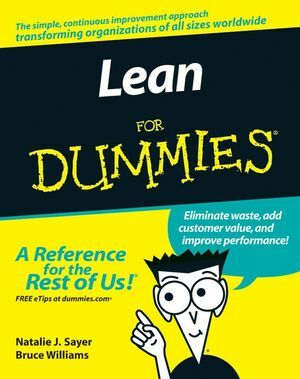 Chapter 16: Ten Best Practices of Lean. Chapter 17: Ten Pitfalls to Avoid.